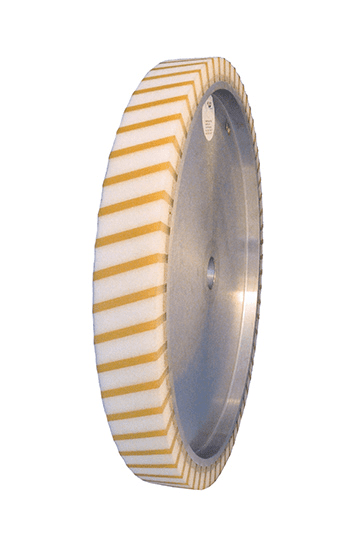 Lamellae of foamed up Vulkollan® and plastic foam are attached alternately to the aluminium hub of the contact wheel FAPI-KS/V. While the width of the lamellae of foamed up Vulkollan® should be kept constant, the width of the plastic foam lamellae can be varied. The wider the plastic foam lamella is, the more aggressive the contact wheel will be. The height of the coating or the length of the lamellae of foamed up Vulkollan® and plastic foam can be varied depending on the application (standard: 25 mm). 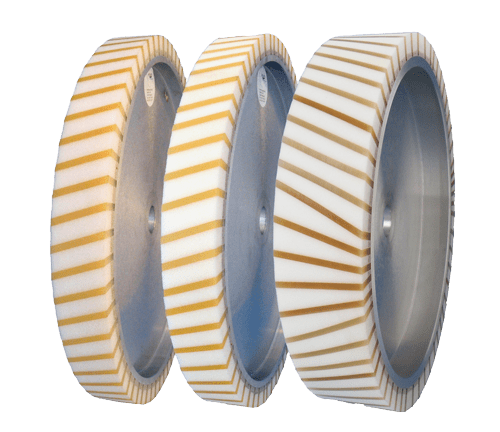 The longer the lamellae are, the less rigid the material becomes, which in turn reduces the aggressiveness of the contact wheel. The contact wheel FAPI-KS/V is used in particular when high abrasion is required in a short time (for example for surface grinding). But even lightly rounded workpieces can be ground without difficulty using this contact wheel.